Expat in the City is all about inspiring and informing internationals living in Munich by connecting them to the best people and businesses who understand what it is like to be new in a country and in a new life. Learn more about our services to get connected to Munich's expats 365 days a year! Want to expand with us? We love to connect and inspire you! It is our passion to connect people with all the services and inspiration that are out there waiting for them in our great city. We believe a successful life abroad starts with getting to know and finding these diverse opportunities. A new life abroad can be seen as a challenge - or as a present. We want to help you discover the treasures it offers. 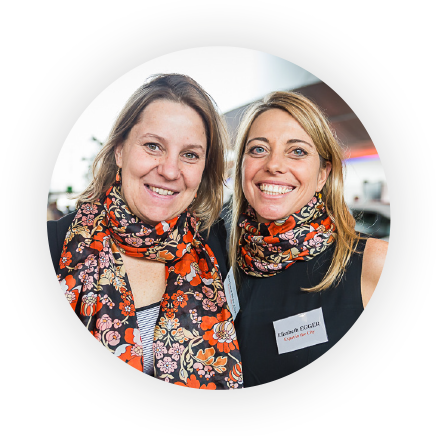 Expat Agents was established by Elisabeth Egger & Barbara Bijvank in order to serve expats and their families living and working in Munich. Having worked with and for expats for many years and starting of as expats ourselves, we act from personal as well as from professional experience that we want to share with our newcomers to Munich. It is our mission to support and accompany, guide and help Munich’s new citizens to settle in their new environment. We believe in going offline, in mixing and mingling amongst the crowd and in putting a face to the services and people that surround us. Therefore we have committed to creating an event that gives our Expats in the City the opportunity to find information and inspiration, to get connected and to discover all that is already out there waiting for them. Through the annual Expat in the City Fair we have created an extensive offline network of great businesses and expats in Munich. The Expat in the City Network & Events website builds on this already existing network by providing an online space where businesses and expats can find one another all year round. And just like for the Expat in the City Fair our aim is to help expats get connected and be inspired in their new home abroad - whenever, wherever they want. Expat in the City Network is an online business directory combined with various marketing opportunities to promote your products and services whilst enjoying great discounts – 365 days a year. What are the benefits of joining the Expat in the City Network? Joining the online network costs €250 per year. You can take advantage of other promotional opportunities when you need it. Fill in the contact form to sign-up for our partnership. We will send you more specific information and discuss your individual needs. Promote your event with Expat in the City. Expat in the City Events is a dedicated space on the website for events aimed at internationals living in the greater Munich area. A comprehensive event listing provides a great way to promote your event amongst your target audience. What are the benefits of adding your event to Expat in the City Events? Inform and inspire people from all over the world! Contact us by filling in the contact form and let us know how we can help to promote your event(s)! Adding an event to the website costs €100 or €50 for partners. With Expat in the City Events we aim to have one central place with events in English taking place in Munich. In addition to offering a place to promote events we also offer made-to-measure event organisation services. If you have an idea or service for a workshop, seminar or expert talk that would be suitable for the international community we would love to hear from you, Together we can make it happen. We help you with finding a location, promoting the event through our marketing channels, organization of the day itself and help you with the topic and content. What are the benefits of organizing an event together with Expat in the City Events? Let us know your ideas and together we identify your needs. Based on your wishes we create a quote for the services to be provided.